12Six days before the Passover Jesus came to Bethany, the home of Lazarus, whom he had raised from the dead. 2There they gave a dinner for him. Martha served, and Lazarus was one of those at the table with him. 3Mary took a pound of costly perfume made of pure nard, anointed Jesus feet, and wiped them[a] with her hair. The house was filled with the fragrance of the perfume. 4But Judas Iscariot, one of his disciples (the one who was about to betray him), said, 5Why was this perfume not sold for three hundred denarii[b] and the money given to the poor? 6(He said this not because he cared about the poor, but because he was a thief; he kept the common purse and used to steal what was put into it.) 7Jesus said, Leave her alone. She bought it[c]so that she might keep it for the day of my burial. 8You always have the poor with you, but you do not always have me. After just performing the miracle at Lazarus's tomb, we now find Jesus mentioning His own soon-to-come tomb. What a stark transition of events. Probably more than any other point in His journey, Jesus longed for the companionship of His friends, longed to be comforted if only for a moment. 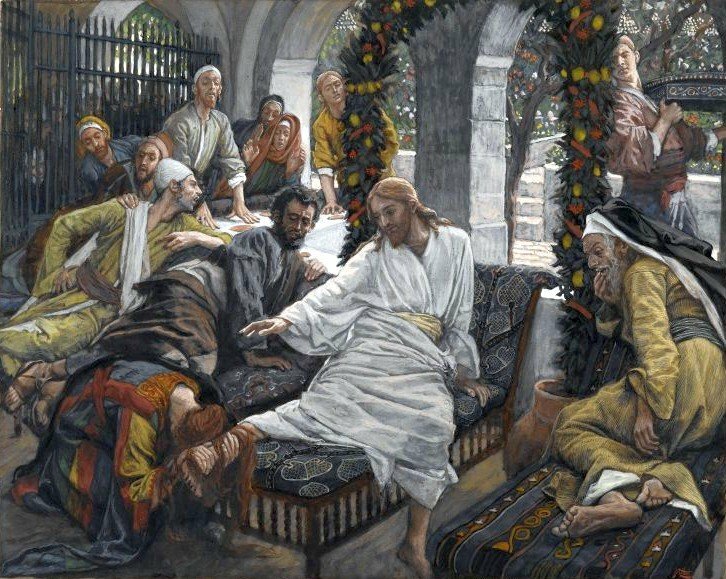 Yet, we find the outer chaos finding its way into this home where Jesus reclined and rested for a moment. Though the air was filled with the fragrance of the very costly perfume Mary had lavished on Jesus, it poorly masked the tension and discord of those present. There was tension between Mary and Martha, between Judas and Mary, between the other disciples and what they were witnessing in general. And of course this tension was merely the continuation of strain and stress we encounter in Jesus creating a whip to drive out the money lenders at the temple and His seemingly harsh condemnation of a fig tree. As Jesus nears the cross, the previously hidden agendas of all involved surface in chaotic tension. Jesus striking statement that Mary's perfume was for the day of his funeral highlights for us His purpose was unchanged and clear - even in the midst of swirling agendas. There are lots of things we want Jesus to be for us. We have many agendas even within ourselves. During this Holy Week, how can you come to a place of becoming aware only of Jesus' agenda? Prayerfully consider that at this point in their journey with Jesus the disciples had not come to see Judas as a traitor. Put aside for a moment what you know about him and think of him as the disciples must have: practical, perhaps wise, careful. Prayerfully meditate on the image above. Who do you identify with in this story? The utterly abandoned Mary or the conservative Judas? Or are you preparing food unseen in the kitchen identifying with Martha as your way of helping out but not fully abandoning yourself to worship? Or, like the disciples, are you silently measuring what you see or feeling unspokenoutrage? In your life you may have areas that you are holding back and pragmatically saving for the future when Jesus is inviting you into extravagant worship instead. Or, you may be actively serving and feeling good about how you contribute, perhaps, but is this merely a means by which you avoid the tension in the room that may bepropelling you to abandon your obligatory and formal postureand worship with all that you have no matter what it makes you look like? As you reflect on the image above, where are you in this story? Wherever you picture yourself, how do Jesus words affect you?